My husband and I shoved as many of our valuables as we could into our compact car after the majority of the space was claimed by our 2-month-old baby, year-old Goldendoodle, and an essentials bag for each of us. It was a split-second decision, but as the eye of Irma drew nearer our confidence buckled. We were afraid to face her toe-to-toe. We evacuated. We were planning to stay. We had taken necessary precautions. Water: check. Non-perishable foods: check. All of our laundry was washed. Baby bottles were sanitized. We were going to stay in a structure built to withstand a category 5 beat down, so we felt confident in our safety. The hurricane analyzer’s spaghetti lines started to move, the American model fell in line with the European model, and all were bringing Hurricane Irma directly toward our location on the southwest coast of Florida. We were going to take a direct hit and we started to squirm. As of Friday night we were going to hunker down and ride it out. At that point most of the news reports were saying, “If you are in a safe place, you’ll be safe. You may have missed your window to leave by now.” We woke up Saturday morning to a phone call from my father-in-law saying my husband’s family was going to evacuate. They weren’t willing to take a gamble. Neither were we, we decided. But we still did. Take a gamble, that is. Just like any situation, it was much more complicated being in the midst of it. People were screaming, “Leave! Just get out! It’s not worth the risk!” But what they didn’t understand was that this was being called the largest mass evacuation in history1, putting millions of people on the same few roads that lead out of Florida. We heard reports that it was taking double the amount of time to get out, were cautioned that gas was running out, and told that cars were being abandoned on the side of the road. 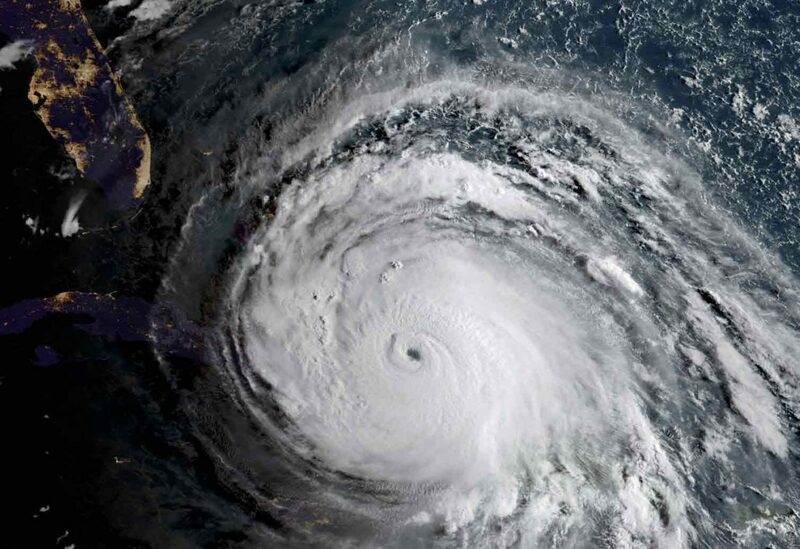 What would we do if we got stuck on I-75 with an infant during “the perfect storm?” We were scared of Hurricane Irma, but we were petrified of meeting her with no covering. We didn’t have the necessary paperwork to fly with our baby, and we didn’t have enough time to get it. We were scared of Hurricane Irma, but we were petrified of meeting her with no covering. I had talked myself into and out of every possible scenario. The safest place to be is in a safe structure, I thought. But what if a freak accident occurs that can’t be calculated? Like the 8.1 earthquake in Mexico early Friday morning that prompted tsunami waves.2 Our safe place was going to be high enough off the ground that we wouldn’t have to worry about flooding, but we could get stranded within the building if the flooding was high enough. What if our baby needed medical attention and we couldn’t get out? I had been all over the board mentally and emotionally and had come to my wit’s end. I realized that there was no way for me to know what plan would ultimately be safest for my family. There was no way for my husband to know either. So I decided that whatever happened, whatever our final decision was, we needed to be a united front fighting for the good of our family. He said he wanted to go. He felt confident that if we left that minute, we could make it out in time, but if we stayed and sat through the storm he would wonder the whole time if he had made the right decision. So we left. As we got onto the highway we saw thousands of people lining the parking lot of Germain Arena, a designated shelter in our area. Each one was making the decision to stay. There were times we got caught in bumper-to-bumper traffic, but we found back roads and weaved our way around. There were times we pulled up to gas stations and found hand-scribbled “no gas” signs taped to the pumps, but we used the GasBuddy app and were able to fill up. There were moments I wondered if we would make it out before the storm hit, but as we inched our way further away from the predicted landfall and closer toward the Florida Georgia line, I found myself saying, “I’m glad we decided to go.” I felt relieved, but torn. Once we arrived at a relative’s home in South Carolina, we all sat around the TV and watched Irma circle her way toward the Florida peninsula. We watched Jim Cantore get shoved by wind gusts and pelted with rain in a parking lot I frequently use. I was thankful to have my husband and baby safe beside me, but I was heavy-hearted at the thought of my parents sitting in their home in Naples. I thought of my friends who stayed—some in their homes, some in a safer place. I knew that each one had been on the same roller coaster of making plans, second-guessing their plans, adjusting their plans, and then finally sticking to their final plan. Each doing their best to make the right decision for their family. I say all of this to say it was not as simple as, “Just get out.” There was no one-size-fits-all answer to this problem. Such is life. Hurricane Irma was an experience that opened my eyes to grace in a new way. Grace for my friends, neighbors, and strangers alike. Grace for people who are making hard decisions every day and just doing the best they can. I was also reminded of the necessity of sheer grit. Grit to commit to the decisions you make. Grit to continue on with that commitment in the face of opposition. Grit to fight for your family. Grit to push through the 14-hour drive with a baby and a very large, anxious dog. Hurricane Irma was an experience that opened my eyes to grace in a new way. In the end, things turned out differently than everyone anticipated. My hometown fared much better than predicted, but devastation occurred elsewhere. People have been impacted. Lives have been lost. And relief still needs to come. If you feel the urge to help the victims of Hurricane Irma, check out Samaritan’s Purse. It’s an established, trustworthy organization that’s been helping victims of war, poverty, natural disasters, disease, and famine since 1970. They currently have two teams of volunteers providing aid in Florida, and you can donate money now or even sign up to volunteer yourself. But regardless of whether or not you donate your time or money, remember you can always give grace. You’ll also like Anatomy of a Strong Woman, Grace is Not Weakness; It Requires Strength, Stop Look and Listen to People Passing By, A Woman’s Grit Is Her Biggest Asset for Success, A Woman of Grit Without a Hard Heart, and you may also want to check out our podcast, This Grit and Grace Life, to hear more talk about what it means to live a #gritandgracelife.